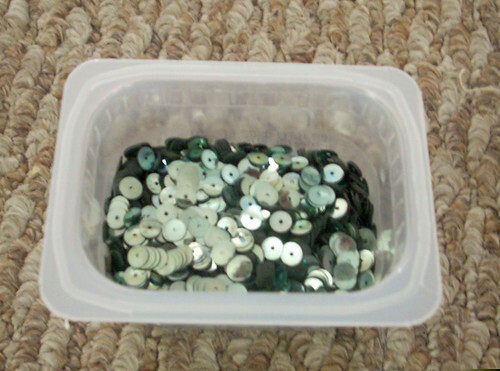 Hey, so, I have this blog. I should probably use it. I've been stitching up a storm on my Williamsburg wardrobe (I leave in four weeks! Eep!) so I haven't had time at home to do much blogging. However, I'm killing time waiting for parents to come in for conferences, flickr and blogger aren't blocked by the webfilter anymore, and thus - post! 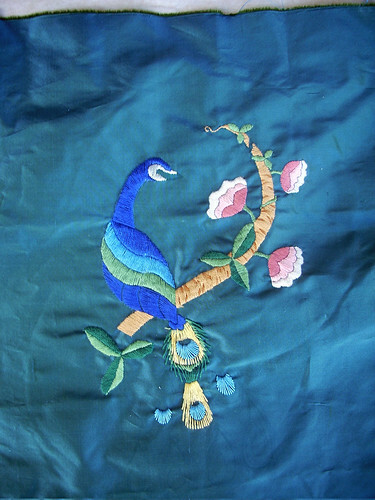 Since I'm in an 18th century frame of mind, I bring you the Peacock Francaise, aka Sara Loses Her Mind and Embroiders a Lot. My first Costume College, I made myself the Partiotic Pouffiness out of horrifying polyester crap and a lot of ghetto-tastic sewing. 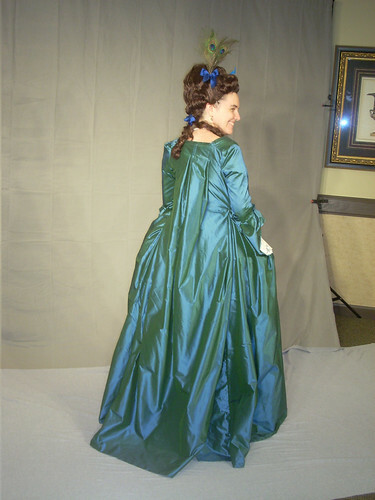 Anyway, in 2007, on a trip to the LA fabric district, I picked up 10 yards of blue/green shot silk taffeta. 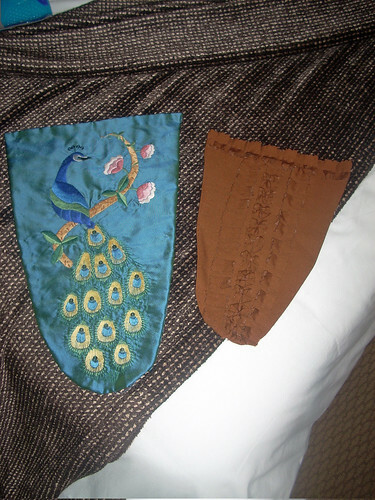 Being my first real silk purchase, I knew it had to be something fabulous and the idea for the Peacock was born. 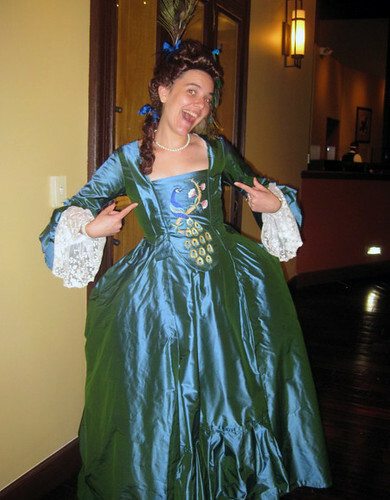 I intended it for Costume College 2008, but as you can see from the pictures of me that year, I was enormously pregnant. 2009 was the year! 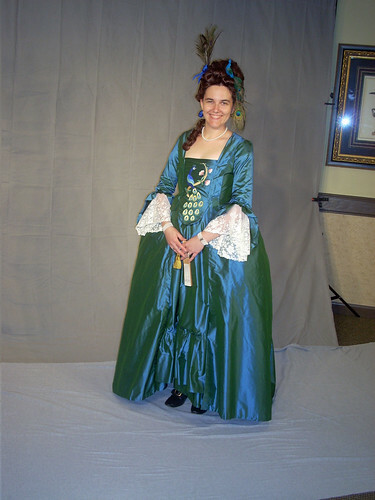 All I knew was that I wanted a better francaise that was (mostly) handsewn and an embroidered stomacher. To date, this is still my favorite embroidery project. The dress turned out to be a little traumatizing. When I fit the lining, I tried to do a lace-up panel under the pleating in the back, and I didn't account for lacing. 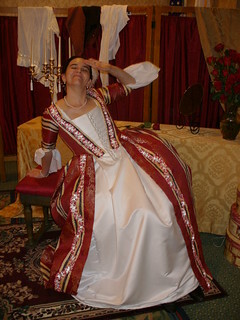 I tried the dress on the night before heading down to Costume College and found that it was entirely too big! After a nice long cry, I begged for help from my lovely roomate and got it.